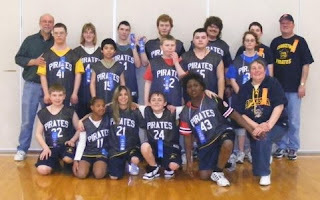 I just want to say how proud I am of all you handicapped mofo's that participated in the section blogging tournament. We came out with first place ribbons and a quality picture to show for it. Now let's gather all the helmets up, hit the road, and do our best blogging to capture the state title. And who knows, one day we may even get to participate in the real blogging sections and not just the retard version. By the way, Doc you might want to try some sun screen, you're looking a little "burnt" and not to mention gay holding onto Skipper's leg.